Description: The 3-manual, 40-stop Wilhelm Sauer organ op. 915 of Dortmund-Dorstfeld in Northern Germany is located in a neo-Gothic brick church, built in 1904 for the strongly increasing population of the German "Ruhr-Gebiet", which was the largest area of coal mining in Germany. The late romantic Sauer organ is one of the very few instruments in Germany, which have survived almost completely in their original state! 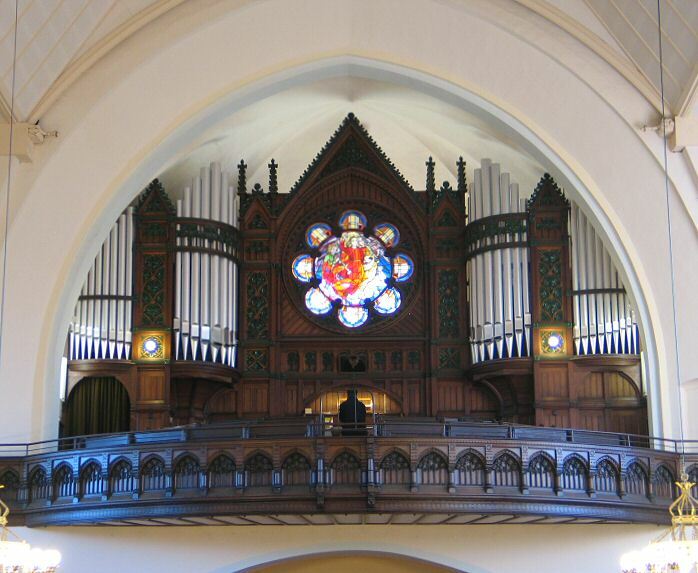 This organ even survived four disasters, World War I and II, the German organ reform movement ("Orgelbewegung") and a church fire years ago, caused by a lightning strike, causing the burning tower to crash down into the church. The (German) organ reform movement, which demanded a come-back of high-quality manufactured organs and considered the sound of Baroque organs as the only valid sound concept. This movement , not understanding (any more) the sound concept and music of romantic organs, usually resulted in a modification or even total dismantling of the (late-) romantic organs, especially in Germany. From today's point of view, we regret this consequence of the organ reform movement and usually don't find many of those organs in Germany. When playing or listening to this organ, you will have the original sound of 1904 with a strong relation especially to the music of Max Reger. Reger himself and Sauer had good relations. Straube performed a lot of Reger works on the big Sauer organ of Leipzig. The organ was recorded in February 2008 with 48 kHz, 24 bit, multi-channel for Hauptwerk 3, using the multi-release technique introduced by OrganART. The stops were recorded with multiple release levels for short, medium and long key attacks for optimal acoustical mapping.